The Twin in Berlin: And So It Begins! Megan totally took my final countdown idea. AND NOW she only has five weeks!!!!!!!!!!!! This past week was cool! We had an appnt with a less active sister in the ward who speaks spanish. the "spanish sisters" in Berlin were there per skype. haha it was so fun!! the sisters taught the restoration, and we sat there in the sister's or should I say hermana's living room with her. They talked about the temple too, it was so cool to hear them talk about the gospel in a language that she understood. She was all glammed up for the skype appnt and she is just sooooo cute!!! I love her so much!!! We have another appnt Wednesday, hope we can get her to come to church! During dooring we found a family from Syria who let us right in. HOLLA. we talked about Jesus and the Book of Mormon. They don't have the same beliefs as us, but the husband wants us to come back in march ( guess I won't be there) when his German course is done. 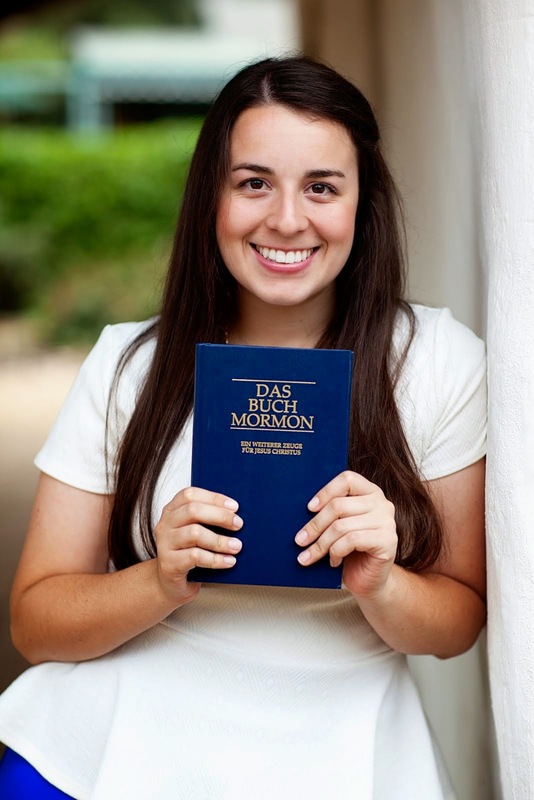 Today we took a Book of Mormon in Arabisch by, and introduced it to them. Such a sweet little family! I hope their hearts can be softened for the message of the restoration. We met with our little family from Macedonia, and this time the husband was there!! That was awesome. We finalized the restoration with some sentences we had translated into Macedonian (thank you technology) and read in the book of Mormon together. I love this little family! Nothing is going right for them yet they still have their trust in God. Although we can't understand each other so well, the spirit is there and they are grateful we come and teach them. Today we go back to attempt to talk about the plan of salvation. One lady we doored the week before last said we could come back tomorrow, so I really hope and pray that goes through!! We got a referral from a ward member of a less active she recently contacted who said she would be willing to have sisters visit her. We have had like noo less active work here (except the cute little lady above, and another one who sometimes comes to church but is waaay too busy to meet) so that was a little tender mercy. We'll call this young lady today. Hopefully we can visit her and strengthen her! Things are looking mighty fiiiiine. Most challenging thing of this week was the cold, probably. Best thing: GERMANY BEING GORGEOUS IN THE SNOW. and the ward here. I love this ward so so much! OH AND we had a little new trainee/trainer meeting in Berlin in the mission home on Thursday. We took a stop at the Brandenburger tor on the way over. Berlin on a cold winter's morning was to die for. Being in the mission home with President and Sister Fingerle was a real treat, There was such a special spirit there! I love them so much! The trainees have a special spirit about them as well. It's humbling. That was definitely a highlight. It got me pumped for my last transfer. Well so as you can probably guess, I'm staying in Cottbus until the end! woooo!!! One of our elders is getting transferred, and another finishing missionary is taking his place. Hopefully I like him. I am honored that I still have six weeks to serve the Lord here in Germany. 6 weeks. what is six weeks? ITS A LONG TIME!!!! A time for miracles and for wanting to give up too. It's crazy how hard Satan has been getting at me these past few weeks. and I'm sure it will keep going until the end. I can totally see how easy it would be to have an easy, lazy, last transfer. BUT it's not going to happen. I love my mission and my Savior too much to let that happen. I am so so so exhausted and probably ask myself a thousand times a day how I will make it to the end BUT I will go until march 2!!! !